"Do you have a key on your Astrocade keypad that doesn't function or is broken? With care and patience, the keypad is fixable. 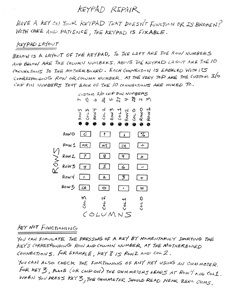 "Below is a layout of the keypad, to the left are the row numbers and below the column numbers. Above the keypad layout are the ten connections to the motherboard. Each connection is labeled with its corresponding row or column number. At the very top are the custom I/O chip pin numbers that each of the ten connections are wired to. You can simulate the pressing of a key by momentarily shorting the key's corresponding row and column number at the motherboard connections. For example, key 8 is row 2 and column 2. You can also check the functioning of any key using an ohmmeter. For key 3, place (or clip on) the ohmmeter leads at row 4 and column 1. When you press key 3, the ohmmeter should read near zero ohms. This is not a FAQ or an index: this is NOT a complete reference (it now covers volumes 5-7). This is an overview of some of contents and articles, but not programs, that are in volumes five through seven (and some from volume four). Do not consider this all-inclusive; it is not. It is a guide that I use for personal reference only, and should be treated as such. The Arcadian has far more information than is cataloged here, so don't be afraid to dig in and get your hands dirty. The "Arcadian" was edited and published by Robert Fabris in San Jose, California from November 6, 1978 until August 15, 1986 (though there are a few one or two page "pre-cursor" newsletters). Currently this FAQ lists dates of publication for all issues of the "Arcadian" newsletter for the Bally Professional Arcade (more commonly known as the Astrocade). This list is helpful for those collecting all of the issues. This is a short FAQ with two spreadsheet files with cumulative statistics about Arcadian subscribers. It's more interesting than you think. The main goal of this FAQ is to put straight all of the programs ever published in the "Arcadian" newsletter, either as BASIC or machine language programs. Programs are listed by Program Name, Author (when known) and the volume and page number where the program can be found. This is a comparison of two Astrocade BIOS. These two ROM BIOS have nicknames: 3159 ROM and White ROM. There are forty-one bytes that are different between the two. They are listed with brief comments followed by excerpts from the 3159 ROM Listing to give greater detail. This article covers what was changed between the three Bally / Astrocade System ROMS. This article complements the "Astrocade BIOS Comparision FAQ." The source code for these ROMs can be found here. Some suggestions on how to fix intermittent problems with Bally Astrocade consoles. On the front of the Bally Astrocade console is a 24-key calculator-style keypad for use with the built in games, cartridges, and most importantly, BASIC. Emulation of this keypad works correctly with the MESS Bally Astrocade emulator, but it isn't easy to use, and must be figured out through trial and error (since MESS comes with no Astrocade documentation). This FAQ will show you how to correctly use the PCs keyboard to emulate the Astrocade. All of the programs in this document have been given PD release by the software author or those people that owned the rights to distribute the program (in the case of Spectre). This software can be legally uploaded and downloaded and made available, in any form, on the Internet or any other distributable media (i.e. floppy disk, paper listing, CD-ROM). Pinout of the Bally Astrocade cartridge port and pinouts of various ROM and EPROM chips. This is a general system FAQ about the Bally Astrocade. It includes information about the system and its hardware. Using the Astrocade newsletters and over twenty years of experience with the Astrocade, Michael White, over the summer of 2001, created a comprehensive list of cartridges. The listing was a printout, the original file having been written on an actual Astrocade using a word processor. Adam Trionfo and Mike worked together on this reorganization of the listing, making this information available via the seventh edition of the Digital Press Collector's Guide in 2002. In June of 2003 this information has been made available via this FAQ so that anyone with a curiosity about the Bally Astrocade can find out more about it. 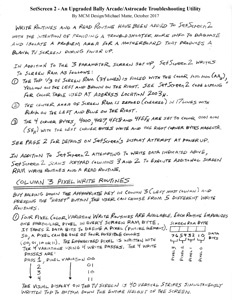 This is the information that Mike White and Adam Trionfo used in the 7'th edition of the Digital Press Collectors Guide. However, this FAQ has been much updated since that edition of the Guide was released. Mike quickly realized that a list-type format was not good enough to make this guide comprehensive, as the hardware items evolved with time; even the Arcade itself underwent several changes during its history! So a HISTORY of each item was called for incorporating all references to the classic newsletters. This is a description of the Bally Professional Arcade video hardware and its associated coin-operated hardware. 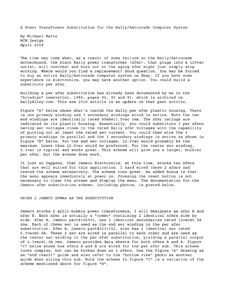 This detailed, 25-page document, describes how the Bally Arcade/Astrocade video hardware works. This was created to dispel the rumor that an unmodified, low-res (160x102 pixel-resolution) Bally Arcade unit can display commercial resolution ("hi-res," 320x204 pixel-resolution) video. The primary sources of information used to write this paper include "The Nutting Manual," U.S. Patents 4,301,503 and 4,475172, the "Sea Wolf II" arcade game schematics and the "Bally Service Manual." 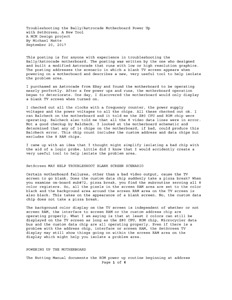 This document was originally made available via the Bally Alley Yahoo discussion group in 2001. The pdf was originally zipped and the file was archived in only that format on BallyAlley.com from 2001-2016. For archiving purposes (to prevent broken links from other sites), the document is still available in that format. 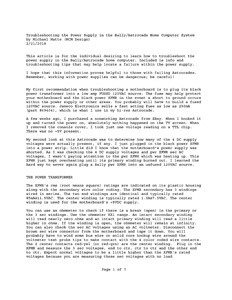 Bally Professional Arcade Video Hardware - Zipped pdf file. This text is a collection of technical info that may be useful to people either dumping ROM carts or trying to make a Bally Astrocade software emulation system. It only discusses cartridge port pinouts and the like; it does not attempt to go any deeper into the Bally hardware than that. Cursor (later renamed BASIC Express at the start of volume three) is an excellent newsletter, on par with the Arcadian newsletter. It was created in 1980 as a for-profit newsletter to focus more on hardware than the Arcadian was currently doing. The Cursor/BASIC Express was published from January 1980 - July/August 1981. Over its three-volume lifespan, the newsletter published 65 programs by 28 different programmers. This FAQ lists all of the programs published as BASIC and machine language listings. The raw data used to create this FAQ can be downloaded as an Excel spreadsheet. This data contains the 65 program names, programmer(s) and locations of the program. This can be downloaded here. The Niagara B.U.G. Bulletin was a newsletter devoted to the Astrocade owners of Canada. There was a B.U.G. (Bally Users Group) in America as well. The Niagara chapter published three volumes of newsletters that totaled 92 pages. The first issue of volume 1 was published on June 24, 1983. Volume 3 only had two issues. The last issue of the third volume was published on March 28, 1985. This FAQ lists all of the programs published as BASIC listings (there were no machine language programs published in this newsletter). The raw data used to create this FAQ can be downloaded as an Excel spreadsheet. This data contains the 14 program names, programmer(s) and locations of the program. This can be downloaded here. By Michael Matte (MCM Design). 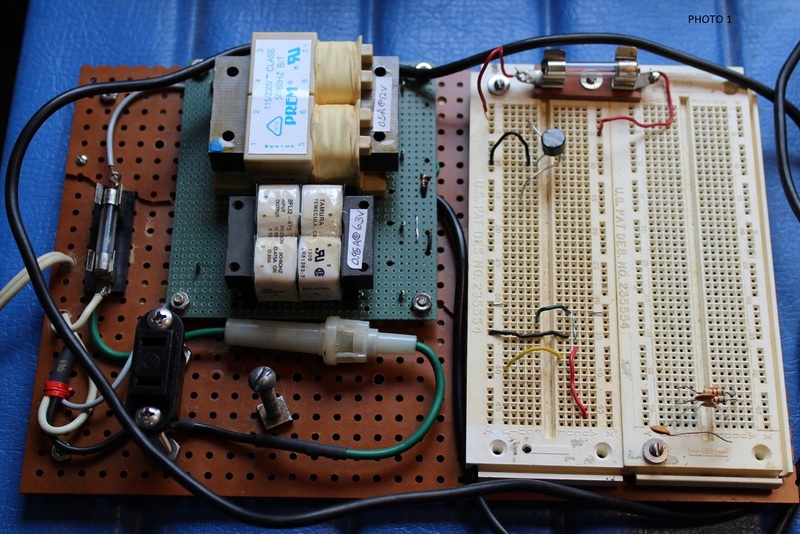 If your original Bally power supply fails, and you have experience in electronics, then these instructions explain how to build a substitute power transformer. This is an attempt to credit those people who programmed the four programs built into the Bally Arcade/Astrocade. These programs include: Calculator (Jeff Fredricksen), Checkmate (Lou, or possibly correctly spelled "Low," Harp), Gunfight (Alan McNeil), Scribbling (Jay Fenton), and miscellaneous code (Ken Freund). SetScreen 2 is an improved version of the original SetScreen, a machine language routine. Setscreen 2 is a visual troubleshooting tool that can be used to help diagnose a failed Astrocade motherboard producing a blank TV screen at power-up. Details are provided in Troubleshooting the Bally/Astrocade Motherboard Power-Up with SetScreen, A New Tool (see link below). SetScreen 2 now has added routines to help a troubleshooter further investigate what is or is not going on with a motherboard graphics-wise and to provide more information to diagnose and isolate a problem area. A read routine is also included for a user who can connect a homemade dual 7-segment display. This archive contains four files: an introduction (that you really should read to understand the listing), a tape software listing (76 pages), a tape vender listing (3 pages) and the database in Access 2000 format. This listing is quite amazing! The PDF file is searchable, so give it a spin; I bet that you will be shocked by how comprehensive that it is. This listing took over a year to complete, and it really shows! 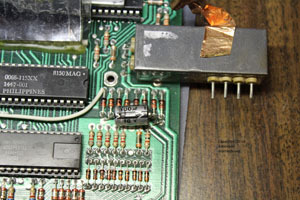 Troubleshooting the Bally/Astrocade Motherboard Power-Up with SetScreen, A New Tool. 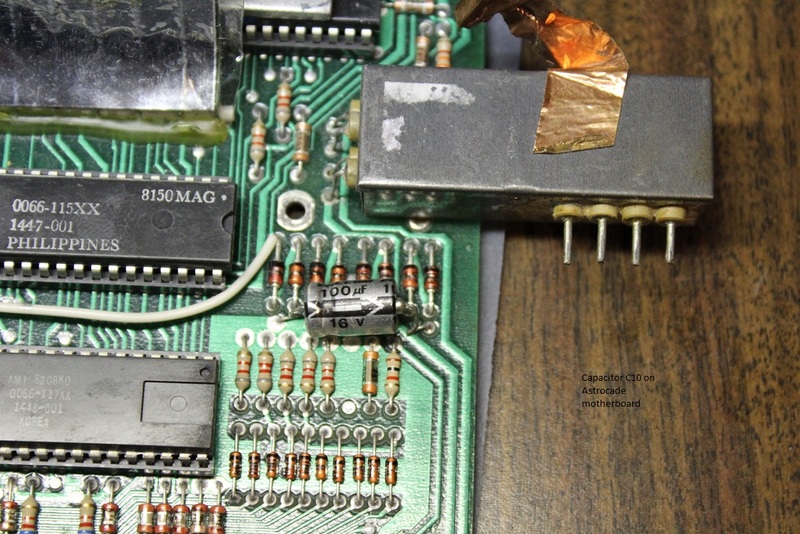 This document is for anyone with experience in troubleshooting the Bally/Astrocade motherboard. It explains one method on how to fix an Astrocade using step-by-step methods. It was written by Michael Matte, the person who designed and built a modified Astrocade that runs with low or high resolution graphics. Specifically, this document addresses the scenario in which a blank TV screen appears when powering on a motherboard and describes a new, very useful tool to help isolate the problem area. 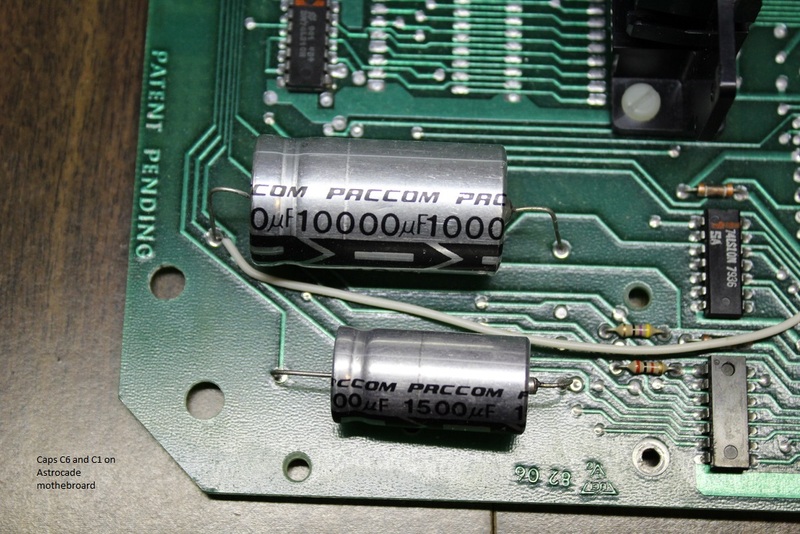 This article is for the individual desiring to learn how to troubleshoot the power supply in the Bally/Astrocade home computer. 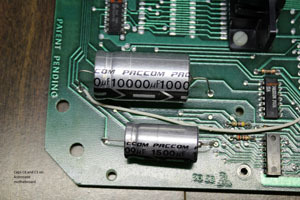 Included is info and troubleshooting tips that may help locate a failure within the power supply. I hope that this information proves helpful to those with failing Astrocades. Remember, working with power supplies can be dangerous; be careful!